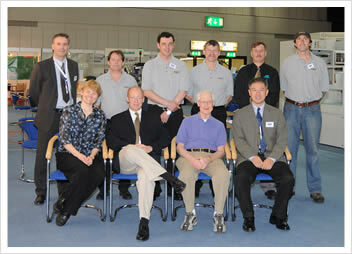 After much preparation and effort the Drupa show held in Germany May 29 – June 11, 2008 has been and gone for another four years. Despite the current economy across the globe, the show proved to be surprisingly successful and the Kluge booth saw a lot of traffic during the two week event. Much interest was shown in our NEW EHG Series Half-Sheet Press, which boasts a small footprint, operator-friendly controls and make-readies, EZ Load Magazine (click for video) and Togglebase Hoist System (click for video). I think the comment that summed up the press and speaks of all of these advantages, is one that we heard from a booth visitor when he announced that “The EHG Series Press was the find of the show!”. Nobody can argue with that. We are truly pleased with our new product. The buzz generated and sales signed on the show floor only confirm that we have built a great machine. Our folder gluers, both the ComFold and OmniFold ran two types of mailers. A photo mailer which proved to be a great take-home piece featuring 3 panels for inserting photographs, and a CD mailer that demonstrated three new features of the OmniFold folder gluer. First, the scoring unit scored the piece in two places, second is the CD pick ‘n’ place unit that placed the CD on to the mailer and thirdly, the NEW inline tabber (look for more on this soon) sealed the mailer shut by applying two tabs (or wafer seals) to the piece. Finally, Drupa served as a great platform for demonstrating our entry into large format Foil Stamping & Embossing. The NEW Kluge V-10 F, which is now scheduled for installation in France, accommodates a sheet size of up to 75 x 105cm – 29 x 41”. The machine includes fantastic NEW features, such as vacuum-assisted feed wheels that optimize the feeding of a wider range of stock, and improved foil control features like 8 foil break sensors, increased access to the foil system and brush/foil rewinder that collects waste foil at optimum speed. Feel free to give us a call (715-483-3265) or drop us a note (sales@kluge.biz), if you would like more information about the products exhibited at the show or any of our complete product line. Our next show appearance will be Graph Expo 2008, October 26 – 29, 2008 in Chicago. Catch us at booth #3411! 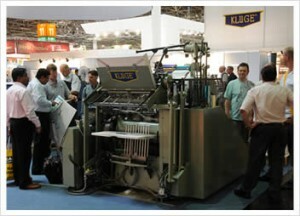 Stay updated with our developments and learn about the print finishing industry at www.kluge.biz.